Ampersand in the final phases of construction. Photo by Melissa Jacobs. San Diego  As he walked through the hollowed-out shell that once was the Mission Valley home of The San Diego Union-Tribune, Casey Brown reminisced about what it once was. “When I was in the third grade, I took a tour of this building,” Brown said. That was soon after the Union-Tribune moved from downtown San Diego. As the new owner of what’s been renamed Ampersand, Brown’s firm, The Casey Brown Co., is transforming the newspaper’s former two-building campus into a top-of-the line office complex with amenities few other office buildings can match. “There’s nothing else like this,” said Matt Carlson, senior vice president of CBRE, which is handling leasing of the 330,000 square feet of office space that’s being created in Ampersand. 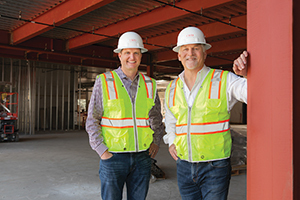 Working with Carlson as part of the CBRE leasing team are Ryan Grant and Jeff Oesterblad. The Casey Brown Co. is the owner of the buildings and the overall developer. The general contractor is CW Driver. Most of the work on the more than $40 million project is finished. As of mid-February, John Kenney, principal with The Casey Brown Co., estimated 60 percent to 70 percent was done, with plans to begin signing leases with tenants in May so they could start interior construction work on the space they’ll use by summer. At peak construction, as many as 250 people worked on the project at any one time, Brown said. 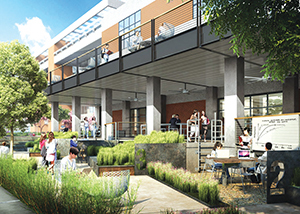 Ampersand is part of a surge of new developments either under way or planned in Mission Valley. The projects include competing redevelopment plans for the 233-acre former Qualcomm stadium from San Diego State University and FS Investors’ SoccerCity and Sudberry Properties’ 230-acre Civita master-planned community. The name for the former Union-Tribune complex, Ampersand, was picked to recognize its newspaper history, Brown said. An ampersand is the last figure in a typesetter’s alphabet. When the Union-Tribune stopped its presses for the final time in 2016, an ampersand was the last character printed. “It’s not marking an end, but a beginning,” Brown said. The new beginning starts at the front door to the five-story former newsroom building on the east end of the site. The lobby has been moved from the north end of the structure to the west side, opening into a courtyard that’s being created between what was the newsroom and the press buildings.